I shared a review of the OvaCue Fertility Monitor a little over a month ago, if you missed it you can find it here. Well, I wanted to tell you a little more about the monitor and the online OvaGraph. 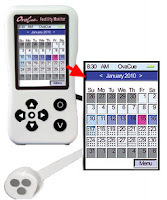 I've continued to use my OvaCue Fertility Monitor to aid in helping us conceive. I also continue to LOVE this little monitor. I am not pregnant yet, but I am patiently waiting. I continue to show ovulation on the 11thd day of my cycle. But in this post I wanted to share another part to the OvaCue and that is the use of the OvaGraph. OvaGraph is an online charting system that helps to keep track of all your readings for ovulation. With the OvaGraph you can chart your basal body temperature and the OvaCue fertility monitor. The graph is easy to use. I have only used the OvaCue part, but there is so much more that can be used. To be honest there are parts that I just don't know what it is, but I am sure it is helpful for someone that is trying to conceive. And the best part of it is that its FREE!!! That is right you can use the online OvaGraph for free. You don't have to have the OvaCue to use the OvaGraph. I have a friend that is using temperature to determine her ovulation. By graphing this you can see a trend and better understand your cycle. There is also a forum where you can interact with other women that are trying to conceive. I have not completely figured out how to read all the charting and what the numbers mean. I mostly follow on the color code and when it tells me the chances of fertility. But after going onto the forum I have seen many are there to help and support each other. There are women that are going through the same things and moderates that are always there to help. So far the OvaCue has been consistent and I am ovulating on the 11th day. I have continued to try and conceive by following this timing. So far I'm not pregnant, but I am hopeful. I am also still following the Shettles Method. The Ovacue is helping me to determine the days prior to ovulation that are best for conceiving a girl. Once again I want to point out that the makers of OvaCue do not endorse gender selection and I am choosing this method on my own. 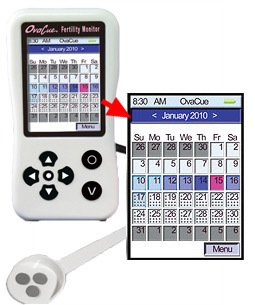 I still love the OvaCue fertility Monitor and the OvaGraph just gives a little more information. I continue to keep trying, although I might be trying too hard (is that possible?). I am currently at a waiting period where I have already ovulated and I am just waiting until I am able to take a pregnancy test. I think this time is the hardest. I keep checking the days and looking for signs of pregnancy. I know I will drive myself crazy sometimes. But it will all be worth it when I see that positive test. I will definitely keep you all updated on any new developments.